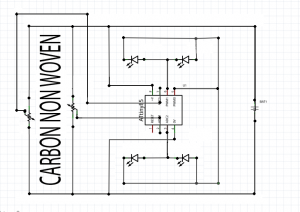 With a rectangular piece of carbon non woven, a microcontroller ATtiny85, with two analog inputs and 4 LED’s a device can be made which indicates on which quadrangle of the carbon a droplet of water has been fallen. This swatch is a micro invention more than design. Following the discussion of last year about production versus personalisation this being an invention doesn’t allow for individuality like my knitted shapes of last year (http://etextile-summercamp.org/swatch-exchange/tiny-knittings/) did. Baudrillard (Baudrillard, 1968, p 198) has interesting remarks about this: “En effet, au niveau de l’objet industriel et de sa cohérence technologique l’exigence de personnalisation ne peut être satisfaite que dans l’inessentiel.” (Literal translation: Indeed on the level of the industrial object and its technological coherence the demand for personalisation can only be awarded in the inessential.) Refrencing this remark would – indeed – be inessential if it didn’t have it’s consequences. So 25 different words, all from the pages 198 and 199 from this text of Baudrillard are chosen and embroidered on the 25 specimen of the swatches. This makes the specimens unique. The 25 form an essential ensemble. 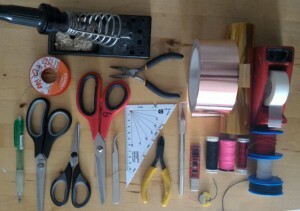 This recursivity and paradoxality is a feature of design which should not be just mindless industrial production. main material: carbon non woven, high resistance type eg Eeonyx 50-70k (i still love the summercamp doggy bag of 2013!) and a droplet of water, which can also be a bit of copper sheet, the flat side of a tea spoon. 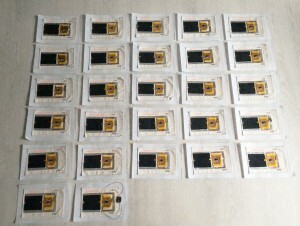 The smd LED’s farnell.nl: http://nl.farnell.com/osram/lsr976/led-0805-red-50mcd-632nm/dp/1226392. 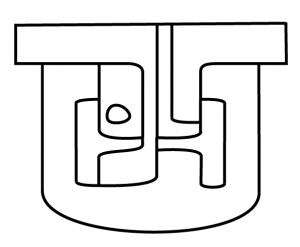 The led orientation – the dot is slightly of center, or the backside has a t shape. 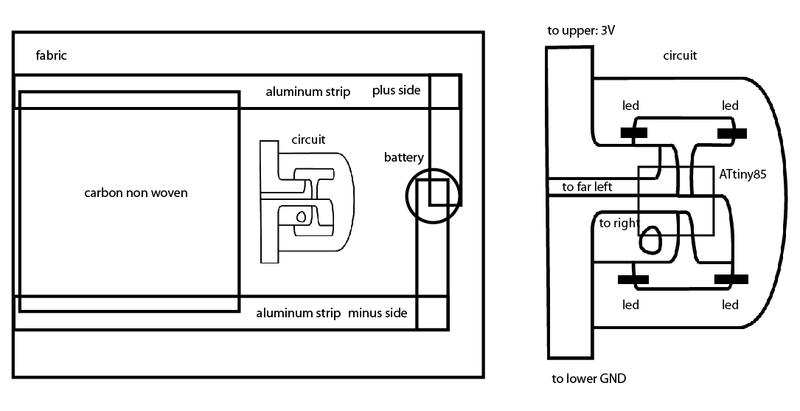 When the circuit is oriented like the drawing below, the top of the t should be to the right: -|, which means the dot is too. the simple text was emboridered using a Janome sewing machine. 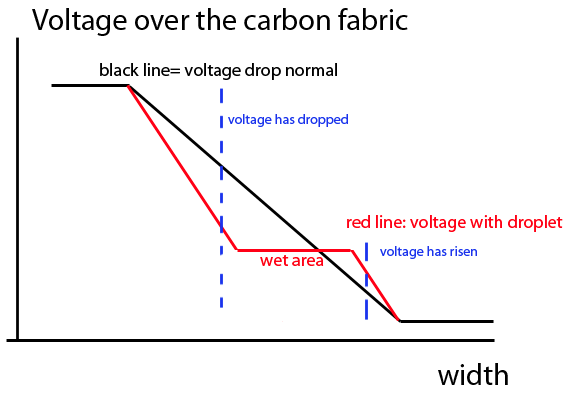 Theory: Measuring the differential voltage distribution over a carbon non woven, when a droplet of water is dissipated, which flats the resistance locally. If you measure in the middel of the narrow strip you see that the voltage is lowered at the left and heightened at the right. You can even calculate at what distance from the point of measurement. 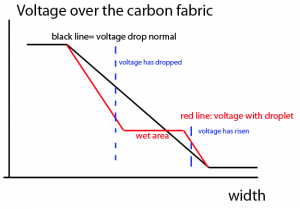 Two dimensional: using two points of measurement, you can figure out at which side there is more voltage drop and then perform the one dimensional analysis. 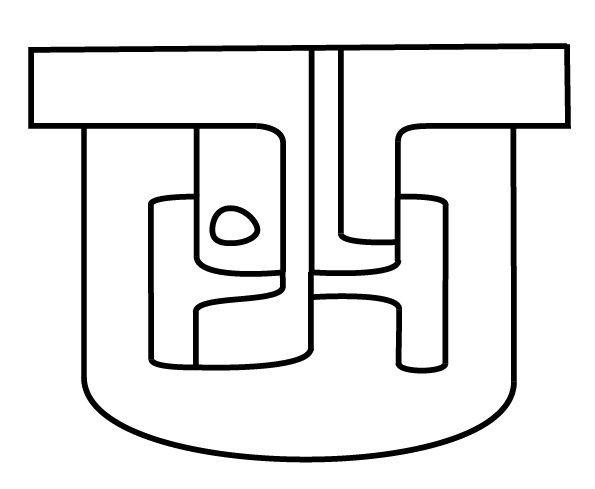 This double procedure gives the indication where the droplet has fallen. 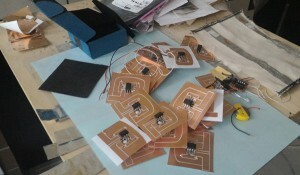 ATtiny85 with 4 LED’s and 2 analog inputs PB2 and PB3, using the technique of more LED’s on 1 PIN, in this case 4 LED’s on 3 PIN’s, PB1 and PB4, with PB0 “in the middle”. 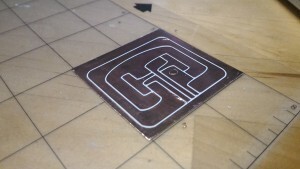 Pattern to cut with vinylcutter: (can be done on copper strip of width 5 cm on paper). with other pieces of aluminum strip at the right of the fabric: make a connection for the coin cell battery. 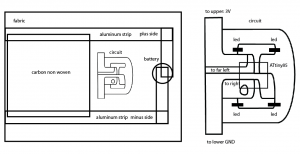 Practical problem solving: the transition aluminum foil – carbon can pose a problem. 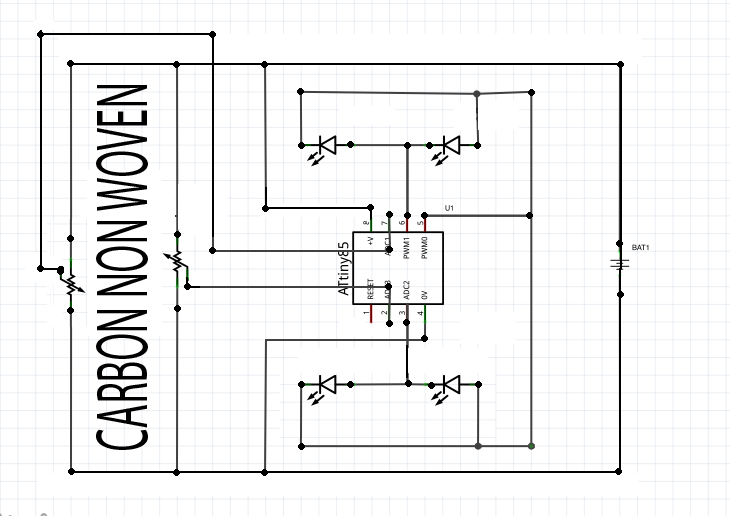 I solved this by putting some conductive paint or glue under the aluminum strip and the carbon. 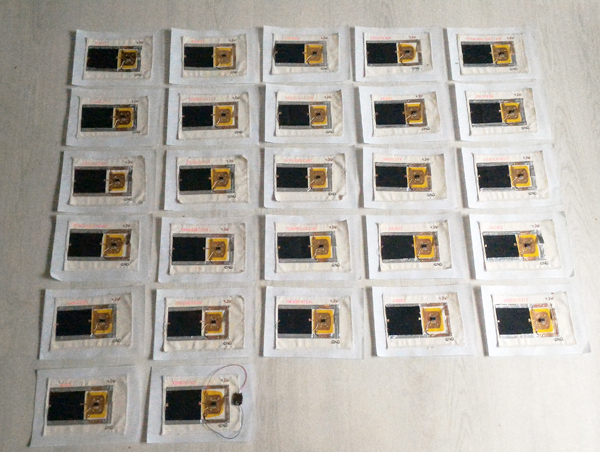 Also the connection of the voltage and gnd wires to the aluminum strip is sometimes not reliable, this was reinforced with copper strip. Probably the whole idea of the aluminum was wrong, it should be done directly with copper sheet. I looked at the tutorial of Kobakant on cutting a soft circuit but made the circuit with a different strategy – big surfaces, small boundaries. 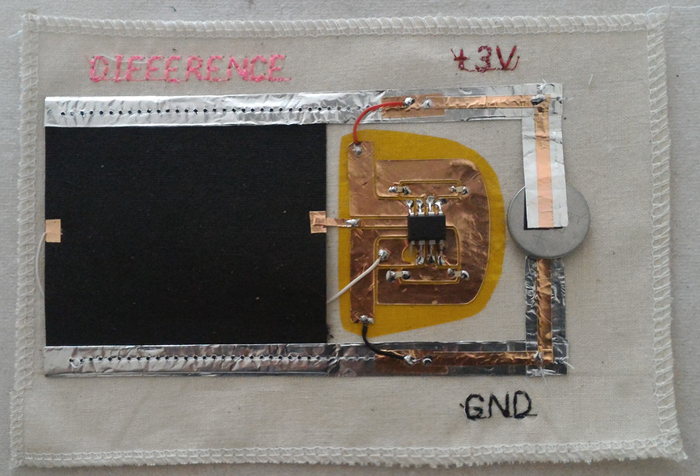 Mika also worked with the carbon non woven in the swatches of 2016: http://etextile-summercamp.org/swatch-exchange/fish-scale-sensor/. Baudrillard, Jean. (1968). Le système des Objets. Gallimard.